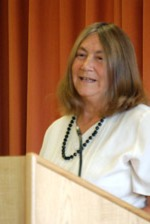 Elaine Storkey, Christian theologian, philosopher and sociologist leads this week on healing ourselves and our world. What do we need to be healed from? What does the Church need to be healed from? Steps towards healing, beginning the process of reconciliation, exploring what a healed Church might look like. What kind of healing is needed? Church and Nations - committing the church to intercessory ministry for healing in our world.